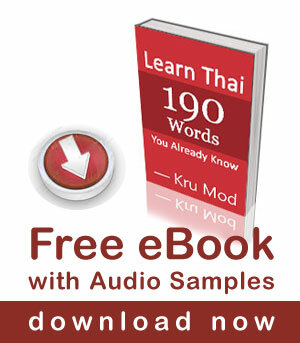 Those who have just started to read and write Thai language might get confused when to use ใ or ไ . The good news is there are only 20 words that use ” ใ “. Every Thai student has to remember these 20 words by reciting a poem in Thai language class, I did it too! I will film a video to show the pronunciation of these 20 words and read the poem for you shortly. This video was in my old YouTube channel which was suspended. thank you for this usefull lesson, I really enjoy your videos! Awww what a pity. The video got deleted. Sawatdee ka Brian, I will fix the article soon. Thank you for visiting my site. Hi Kru Mod! I was just wondering if you have made a follow up post to this yet? I understand about 30% of what they are saying in the video haha. เคียง has the same meaning as ใกล้ – ‘near’, but it is usually used together ใกล้เคียง (in spoken Thai, we just say ใกล้). I would like to know what means เห็นด้วยไหมคะ and how do you prononce อนุสาวรีย์ is it a-nu-saa-wa-rii or a-nu-sao-wa-rii ? yee sip mawn jam jong dee… what does it means? Remember thsese 20 words with ใ well. Dtankiu laai for this jewel of the Thai culture. Don’t need anything better to close the month of May. Kho thot krap, does this precious poem use rhyme and meter? Just out of curiosity.